Quickly and easily converts PDF files to High quality DXF for fast and efficient editing in CAD. Convert thousands of PDF files to DXF files in one easy step. Converting your PDF to DXF is a simple process. Add individual PDF files by clicking the "Add PDF Files" button or add all the PDF files in a particular folder by clicking the "Add Folder" button. Set the "Output File Type" option to DXF and set the "Output Folder", you can also choose the "Output to Source Folder" option. Click the "Convert" button to start the conversion. 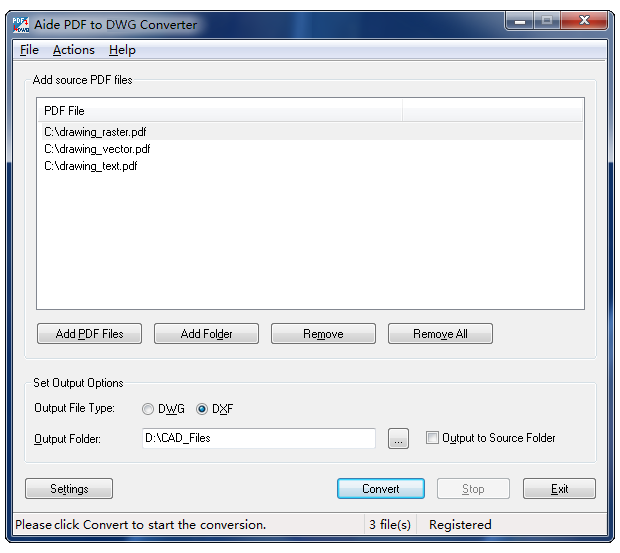 Aide PDF to DXF Converter is a high-performance program, it converts PDF to high quality DXF format. Tip: DXF (Drawing Interchange Format, or Drawing Exchange Format) is a CAD data file format, and it compatible with any popular CAD systems. It is for enabling data interoperability between AutoCAD and other CAD programs, and it is sufficient for AutoCAD and other CAD systems data exchange needs. Microsoft Windows 10, 8, 7, Vista, XP, 2000, 98, 2003, Me, NT or 95. 128 MB of RAM (512 MB or more recommended).